Chris Tulach is an associate brand manager for Wizards of Coast, responsible for Magic: The Gathering play programs such as Friday Night Magic, Prerelease, and Magic League. A gaming convention veteran, Chris has been involved in D&D and Magic organized play for over 20 years, and has been a Dungeon Master for over 30 years. He was a designer on Commander (2015 Edition) and has contributed to design and development on several D&D TRPG products and board games. In-store play is one of the best ways to foster community among Magic players, to meet new friends, and to experience everything the game has to offer. Over the past year we've been ramping up play offerings, from the introduction of Leagues to the competition offered by Standard Showdown. Our play programs are constantly evolving, and our next round of changes takes effect with the launch of Ixalan. These changes are the results of feedback from players and stores across the globe, and we're excited to bring them to you. Let's jump in! Game Day has long served as our de facto store championship, so we're going to give it the spotlight it deserves. As such, we're moving Game Day to the end of a set's season, renaming it the Store Championship, and improving rewards with previews of the next set. What does this look like, exactly? Each week, stores run Standard Showdown events to help you hone your skills and experiment with the metagame. Once you've put your deck through the crucible of regular weekly play, you'll feel ready to compete for the title of store champion. The Store Championship at the end of the season awaits you, offering foil full-art promo cards that look at the next set just for participating! In addition to promo cards for everyone, store champion playmats and program-exclusive deck boxes await those who emerge victorious. Store Championships begin with Ixalan and will be held on December 30–31, with promo items showcasing Rivals of Ixalan! 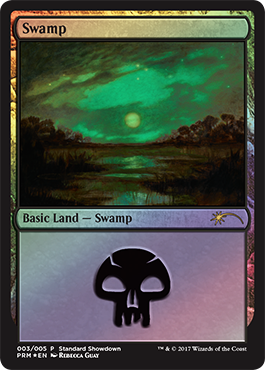 FNM has been and continues to be the foundation our weekly in-store play. It is one of our longest-running and most successful play programs in our 25 years, so we're not looking to mess with the formula too much. 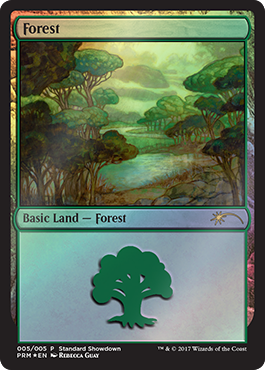 We are making two changes that are related—FNM "seasons" now align with set releases, and promos, which have previously been foil cards, will now be foil double-sided tokens. 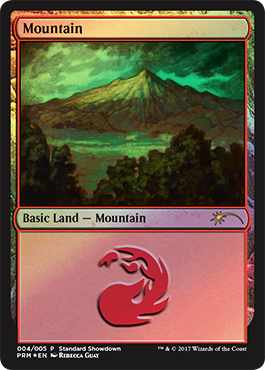 The first change is easy—monthly FNM packages were mostly arbitrary and didn't always align with the latest and the greatest of what Magic had going on. By aligning seasons (which, to players, mostly indicated what promos you could receive) with the sets, we can better give players experiences that are relevant. The second is a move to foil double-sided tokens from the then-current set rather than foil cards from recent Standard-legal sets. We're hoping foil double-sided tokens offer something different and exciting. The player response has been very positive toward the recent foil Zombie tokens and the Thopter/Servo tokens, and they keep asking us for more venues in which we can give these out. We think players will find these rewards interesting and a fun reward for playing. The first series of three tokens are all from Ixalan, and you'll be able to start getting them at FNMs starting October 6, after the release of the set. Those tokens will be given out prior to January 19, when Rivals of Ixalan releases. Here we're making a small change, again, to diversify our promo cards. 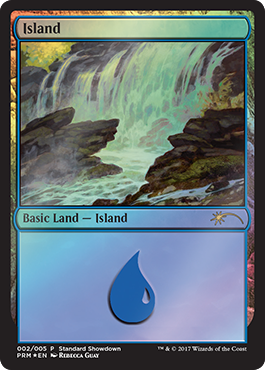 In this case, we've heard that players want more ways to get promo lands through play, so starting with Ixalan, the Standard Showdown booster prizes now come with a foil promo land in each booster! 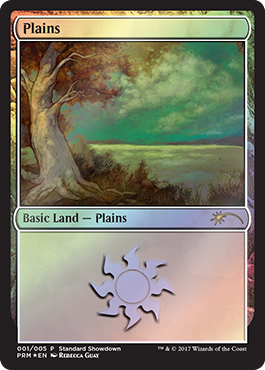 Those lands will feature new or highly desirable art from Magic's history, including, in the first batch, these gorgeous Rebecca Guay lands, never before available in foil! At Magic Open House, you'll now be able to take home a foil full-art promo card from the upcoming set! For Ixalan, that means you'll get an Ixalan card a week prior to the Prerelease, on September 16–17. League—the format where you start with three boosters and a 30-card deck—has been rolled out and amped up over the past year as it continues to gain traction. So, to continue improvements to the program, we're adding a promo card just for participating! You'll start receiving a promo card when participating in Ixalan Leagues (while supplies last at local, participating stores). That's it for now! We're constantly looking to innovate on our in-store play programs, so we're happy to take feedback through local stores or by contacting us at @wizards_magic on Twitter!